Reading and share top 6 famous quotes and sayings about Casting Vote by famous authors and people. 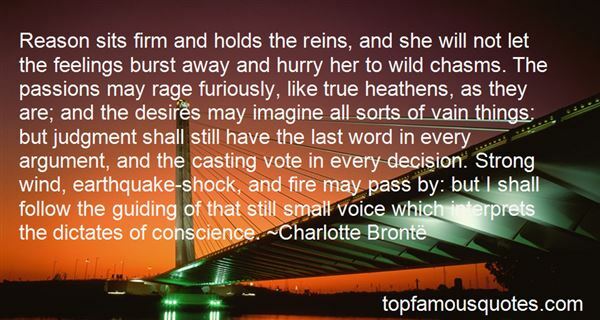 Browse top 6 famous quotes and sayings about Casting Vote by most favorite authors. 1. "Reason sits firm and holds the reins, and she will not let the feelings burst away and hurry her to wild chasms. The passions may rage furiously, like true heathens, as they are; and the desires may imagine all sorts of vain things: but judgment shall still have the last word in every argument, and the casting vote in every decision. Strong wind, earthquake-shock, and fire may pass by: but I shall follow the guiding of that still small voice which interprets the dictates of conscience." 2. "Abstention means you stayed at home or went to the beach. By casting a blank vote, you're saying you have a political conscience but you don't agree with any of the existing parties." 3. "If I think of the ballot as a potential bullet, I will be more careful when I vote. The word vote comes from the Latin word votum, which means "will." When I cast my vote, I express my will. Indeed, if my vote is decisive or a part of the winning majority, then I am not merely expressing my will but imposing my will on others.Many people think that the vote is merely a means to express personal desires or to seek personal gain, usually at the expense of others. 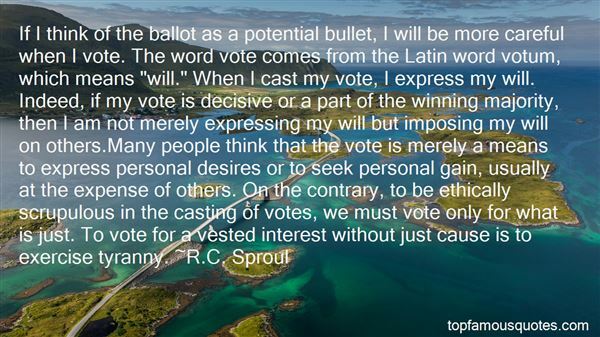 On the contrary, to be ethically scrupulous in the casting of votes, we must vote only for what is just. To vote for a vested interest without just cause is to exercise tyranny." 4. "In the end it was Tabby who cast the deciding vote, as she so often has at crucial moments in my life. I'd like to think I've done the same for her from time to time, because it seems to me that one of the things marriage is about is casting the tiebreaking vote when you just can't decide what you should do next." 5. "Genre categories are irrelevant. I dislike them, but I do not have the casting vote." 6. "I tried to map the cultural trends leading up to it but as I did they grew, interconnecting and weaving backwards and sideways out to everything. 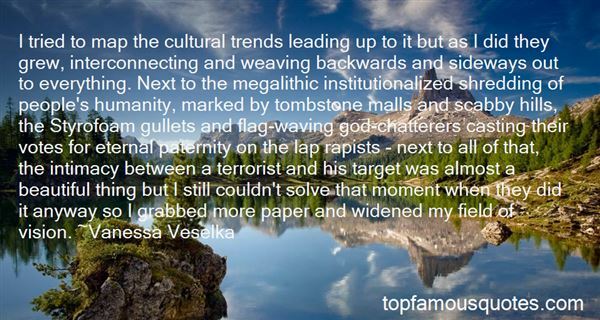 Next to the megalithic institutionalized shredding of people's humanity, marked by tombstone malls and scabby hills, the Styrofoam gullets and flag-waving god-chatterers casting their votes for eternal paternity on the lap rapists - next to all of that, the intimacy between a terrorist and his target was almost a beautiful thing but I still couldn't solve that moment when they did it anyway so I grabbed more paper and widened my field of vision." I've always chosen incredibly different roles and things that are quite offbeat. That way you're not limited."